Brow lift & temple lift. Drooping eyebrows with vertical frown creases and horizontal forehead lines are very common sources of concern. The forehead and eyebrows are important facial features with which we communicate our emotions. Premature or excessive drooping or wrinkling of the brow and forehead can make you look serious, angry or sad when you are not. Many factors contribute to the appearance of the eyebrows and forehead. Deterioration can be caused by ageing, genetic predisposition, and – particularly in Australia – sun exposure. Early ageing, or isolated features such as vertical creases between the brows are best treated by non-surgical means, usually injectable anti-wrinkle agents. These work very well as they freshen and soften lines around the brow, and can lift the lateral brow a few millimetres, often making all the difference. This is a simple walk-in walk-out office-based treatment, which can be repeated from time to time. 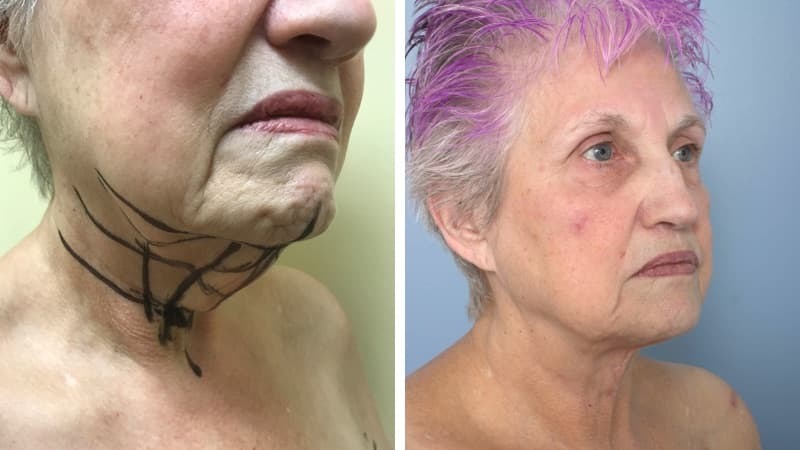 Sun-related skin damage may also be treated with chemical peels or laser, and these combined treatments may produce significant rejuvenation in selected patients. 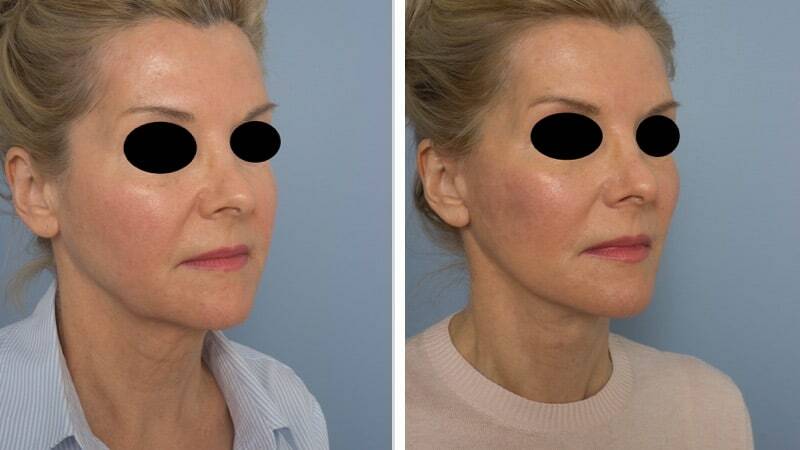 However, as these changes progress, they may be better managed with a surgical brow lift. Before you have a brow lift, it’s crucial to understand exactly what it is. 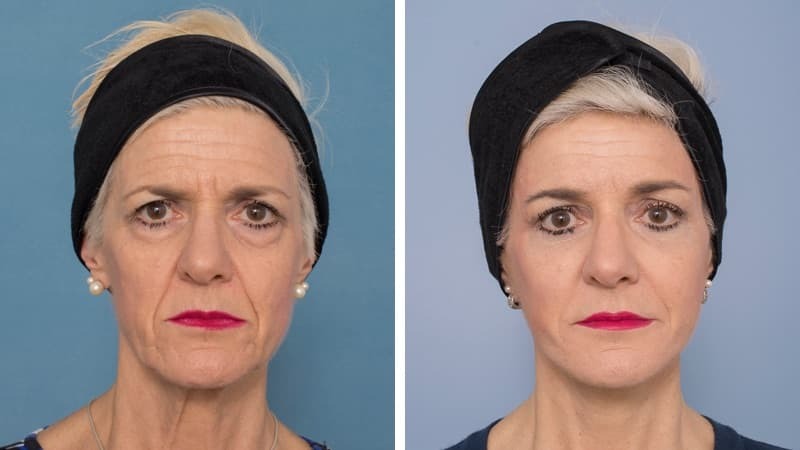 However, it can be very hard to assess and understand the results of a brow lift – partly because of its confusing name, and partly because not many people understand what it actually does. Before you commit to having surgery I will discuss this with you in detail. Key Point: A brow lift is not actually a “lift.” It is more a stabilisation, which allows the surrounding tissues to relax – they no longer have to strain in order to keep your brow up. Many patients I see are afraid that the results of a brow lift are not long lasting, and they often believe that there is a high failure rate. Apparently, these ideas are frequently discussed on the internet. The truth is when a brow lift is done well, it is a long-lasting procedure with a low failure rate. My personal view is that either inadequate tissue release, or poor brow lift fixation techniques are to blame for a poor outcome. As we age, our brows and forehead can droop. A low brow can make us look older, and it can cause the brow itself to be poorly shaped. If the lateral brow droops, it causes excessive skin to gather around the outer eye, and this can make you look older still. This is often mistakenly attributed to eyelid ageing rather than the brow – but the brow is usually the culprit. There is more to the problem. Our brain doesn’t care how we look. In order to protect us it wants us to see well – to have a full visual field. This is a human protective mechanism. So, as our brow gets heavier, our frontalis muscle (the forehead muscle which raises our brow) becomes more and more active as it tries to keep our drooping brow from restricting our vision, to the point where it is overworking. This is a condition called frontalis strain. Frontalis strain is the muscle activity which causes forehead wrinkles, often a raised inner brow, and an appearance of anxiety or strain. It is not a relaxed and rested appearance. Oddly enough, if there is frontalis strain, the brow may not actually look low. It can even look high – in this case it takes unconscious effort to keep the brow high so we can see, and this may cause tiredness or headaches. The point is that the forehead muscles are working hard to keep the brow up, and this is not a good thing for the way we look or indeed the way we feel. Stabilise the brow, so that it rests in a good position without effort. The frontalis muscle can relax, and the strain disappears. Elevate the brow position when it is low. A successful brow lift will provide a more rested appearance of the forehead and upper face, usually with fewer wrinkles, and the brow itself should be better shaped. The results of the operation should last, that is the brow should not quickly relapse. In my practice, I use extensive fixation in a brow lift, normally fixing the forehead and brow into a new position through around 8 – 10 fixation points to the skull. The result can be expected to be long lasting. A brow lift is one of the best facial rejuvenation procedures available. There are no visible scars, and surgery typically results in a more rested and youthful appearance in an undetectable way. When setting our goals, and assessing the results afterward, our success will be judged by the achievement of a rested and more youthful brow and forehead appearance. We will use a general anaesthetic. I will mark you and talk with you before the operation to confirm the plan. No hair is shaved, but it is washed and prepared for the surgery. The surgery is carefully carried out in sterile conditions. Scalp incisions are closed with skin staples, for the reason that they are gentle to hair follicles and do not damage them. A light, not too tight head bandage is used at the end. I almost never use drain tubes for brow lifts. This is a day surgery or an overnight stay. We place protective ointment in the eyes, so vision may be blurry on waking. Medication is given to limit any discomfort, headaches or nausea. The operated area may remain numb as local anaesthetic is used to minimise discomfort. We encourage you to take fluids by mouth as soon as possible after the operation. We may place ice packs on your face to minimise bruising. Your head will be gently elevated. At home you should set yourself up in a comfortable chair, couch or bed, with your head elevated. It is vital to maintain an adequate fluid intake. There will be some discomfort, but it is usually not too severe. Bruising is common around the eyes. You will receive dressing care instructions before going home, and we will give you any prescribed pain medications, antibiotics or eye drops. You may resume driving once you are comfortable, can react quickly if necessary, are not taking strong painkillers and can see normally. This usually takes between seven and ten days. You should avoid heavy exercise for at least three weeks following surgery. The specific complications related to brow lifts include: bleeding requiring return to the operating theatre (haematoma), infection, nerve injury resulting in temporary or permanent loss of movement of part of the brow, poor or obvious scarring, asymmetry, and temporary or permanent loss of sensation in part of the facial skin. Significant complications are uncommon. The sensation of the scalp skin will be altered by surgery. In endoscopic brow lift procedures, these changes tend to be minor and short lived. In rare instances, long-term numbness of the scalp behind the incision may occur. In open brow lifting procedures, some numbness of the scalp behind the scar is normal and expected. Before you commit to having this surgery it is important that you read the document “Consequences, Risks and Complications of Brow lift“ which we will provide for you.